After we finally arrived at our chosen overlook part way up Glass Mountain, we milled about a bit (it was a geology field trip, after all), and then we gathered 'round a map that one of our tour leaders, Julie Donnelly-Nolan, had placed on the ground. Above, my rock hammer is in front of blocks of relatively light-colored, vesiculated, rhyolite obsidian (AKA pumice, but in this case it's pumiceous flow-rock, not tephra). Julie Donnelly-Nolan points to her map of the Glass Mountain dacite-rhyolite flow, Siskiyou County, CA. 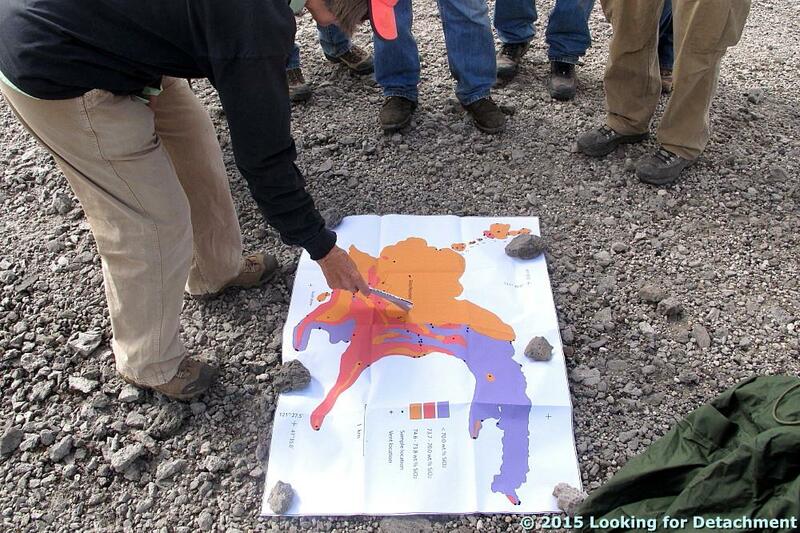 The map, not included as part of our field guide packet (Coyner, 2015), was created by Julie, a geologist for the USGS. She's been working in the area for many years. 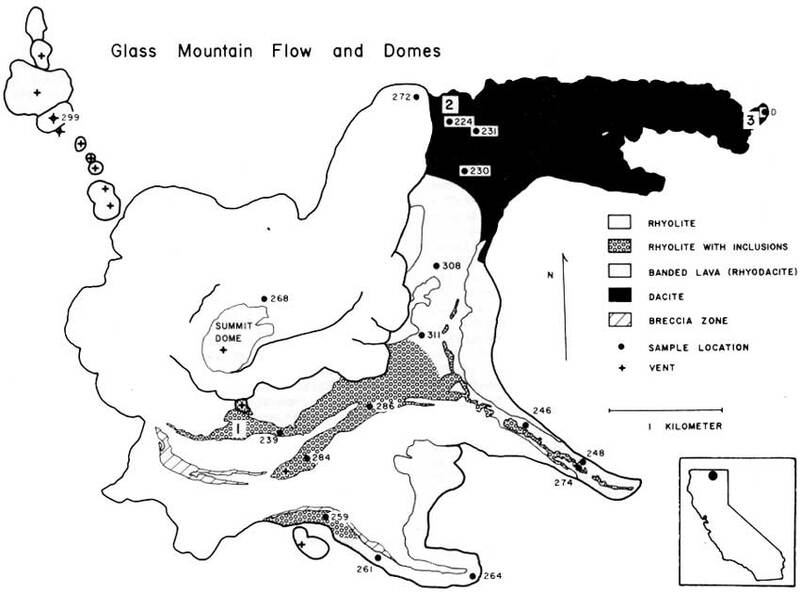 The map is similar to a map by Eichelberger (1981), which he published in an article about magma mixing at Glass Mountain, an article that is part of a larger field guide to several volcanic areas in Idaho, Oregon, and northern California (Johnston and Donnelly-Nolan, 1981). The road log for the Glass Mountain part of our GSN trip was taken in large part from the Medicine Lake Highland road log section of that larger field guide (Donnelly-Nolan et al., 1981). If you check out the guidebook, be sure to read Wes Hildreth's tribute to David A. Johnston, who died at Mt. St. Helens in 1980. The 1981 field guide was published after his death. As you can see below in a rotated version of the map, the Glass Mountain dacite-rhyolite flow "consists of three dacitic eastern lobes which grade westward to rhyolite and are overlain by rhyolite lobes" (Donnelly-Nolan et al., 1981, and in Coyner, 2015). Well, maybe not all of that is obvious at first glance, but read on. 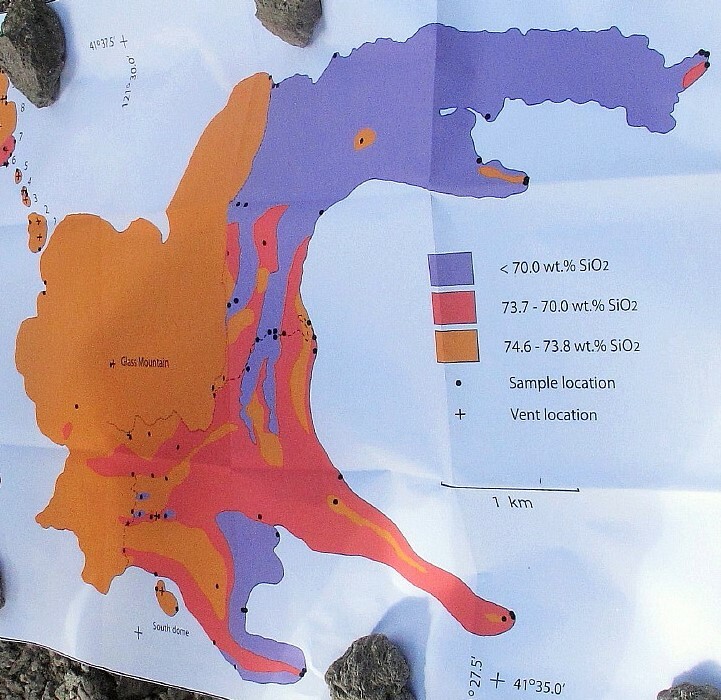 Map showing the silica content of different parts of the Glass Mountain dacite-rhyolite flow (Donnelly-Nolan, unpublished). North is up. During the rest of this post, I'll be referring to the dacite flow lobe (purple, in the northeast), the rhyodacite flow lobe (red with a central ribbon of orange, in the southeast), and the south flow lobe (mixed orange, red, and purple, in the south to southeast). 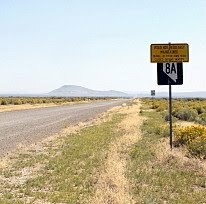 I'll also mention the rhyolite flow lobe (the central and northern orange area, including a well-definable flow and central dome area with margins that overlap the slightly older dacite and rhyodacite lobes), and the mixed area centered between the dacite and rhyodacite lobes. 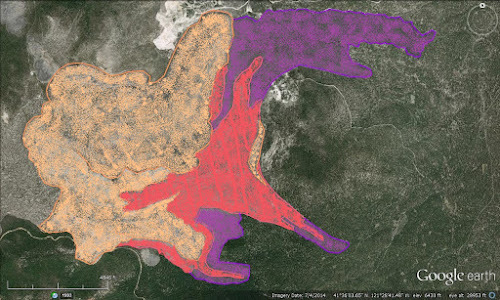 On the map, the highest silica parts of the flow, the rhyolite, are in orange; the parts of the flow with lowest silica content, the dacite, are in purple; the areas with silica content in between rhyolite and dacite, essentially rhyodacite, are in red. 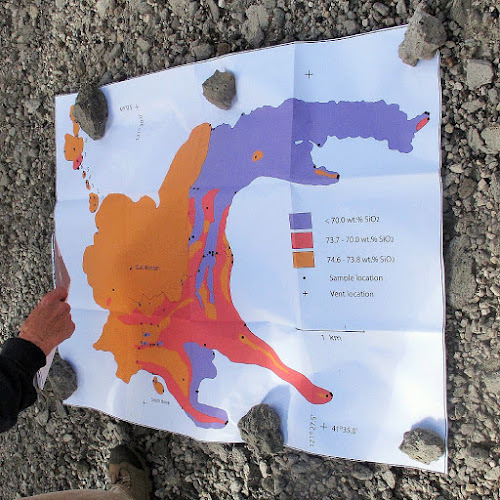 NOTE: Though by many classification schemes the silica content of rhyolite is about 68 or 69% and higher (the USGS appears to be using two different cutoffs), and the silica content of dacite ranges from about 63-68% or 69%; TAS diagrams show dacite compositions as high as 72-75% (depending on what version of TAS one happens to choose; here's one; TAS explained here and here; and a lot more about the classification of igneous rocks—including all kinds of diagrams, references, and a flow chart—can be perused here). Rhyodacite is a term generally used for rock composisitons between rhyolite and dacite (USGS, OSU), rather than a specific field in most classification systems. The colorful map (I love color!) shows that the lithologic composition of the overall flow, which is thought to have erupted during the course of several or many days or weeks rather than over several months or years, is quite variable. The complexities of magma mixing and eruption to produce this variability are described by Eichelberger (1975, 1981). Basically, it's complicated: first, basalt intrudes a rhyolite magma chamber; then mixing creates rhyodacite and dacite, which float to the top of the chamber in his eruption scenario; eruption, triggered by the mixing, produces dacite, then rhyodacite, then rhyolite. Below, I decided to see what kind of map I would come up with going mostly by color and topographic expression of the flows (with a lot of help from Julie's map). 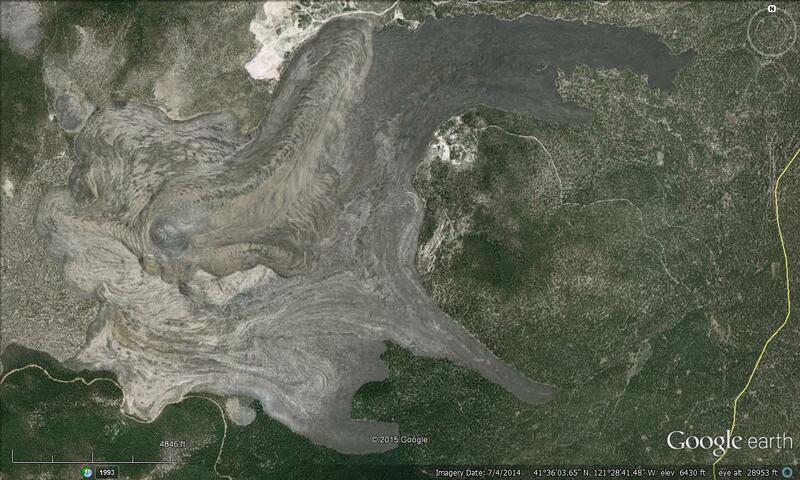 Google Earth image of the Glass Mountain dacite-rhyolite flow. Here, I've delineated the dark areas with purple lines, the light, viscous, and some banded areas with orange lines, and the in between areas with red lines. You can see that there are several areas where the lines I've drawn could be moved around, for example some of the banded areas: do they belong properly in our red or orange category? I've added some colorful fill to facilitate comparison to the geologic map. Here's the rotated map again (and it's skewed). My "map" or cartoon as drawn on the Google Earth image is comparable to the rotated geological/compositional map (yay! ); but really, this was just an inconsequential exercise, one that could have easily produced a considerably different map, possibly by using as many as 5 major fields (for example, if the banded-looking areas were picked out separately, and with the upper, well-defined rhyolite flow that heads off to the northeast drawn as a separate unit). Without chemistry or an already existing geologic map, this is the sort of exercise that could be done prior to heading into the field, giving the mapper an idea what to check out, although just taking an aerial image or air-photo into the field would serve the same purpose. Well, that was really a kind of long aside, almost like a post within a post! Besides hanging around the map and hefting large rocks, the view from the east side of the rhyolite flow (see our location below the post) was good—not great simply because of the low-hanging clouds that hadn't lifted. I thought I might have the actual top of Glass Mountain in this photo, way over to the right, but the dome-shaped peak was covered with clouds. Instead, we can see the steep face of the rhyolite flow where it abuts a highly mixed part of the flow: the central section between the rhyodacite and dacite flow lobes (see map above). Photo looking nearly due east. This view looks out across the dacite flow lobe (dark brown and mostly in shadow past the light-colored rhyolite blocks in the foreground). Timber Mountain, the circular, gently sloped mountain dead center in the distance, is shown to be underlain by the the "older basaltic andesite of Timber Mountain" on Sheet 2 of this map (Donnelly-Nolan, 2010). It has been dated at 1.820±0.042 Ma, i.e., late Pliocene. Oh, and btw, the Glass Mountain flow erupted about 900 years ago: it has a calibrated radiocarbon age of 890 BP (Donnelly-Nolan et al., 2007). 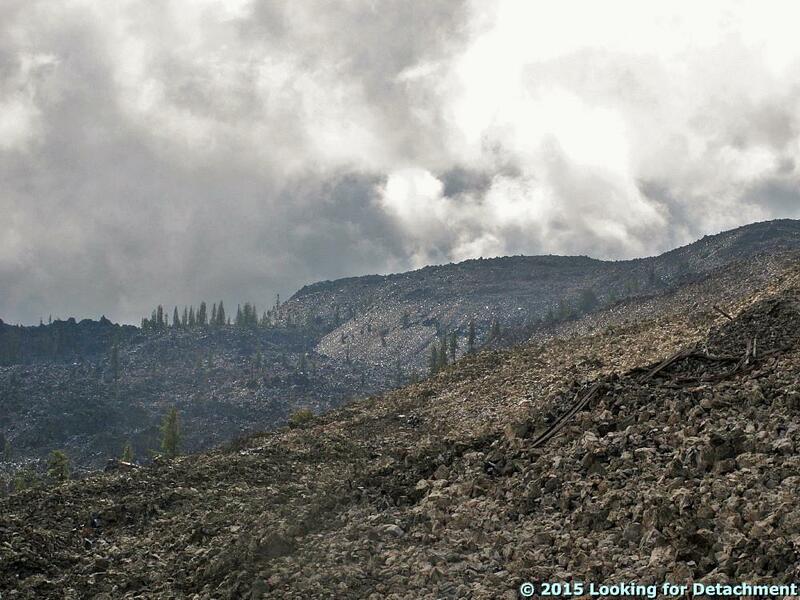 With the blocky rocks of the dacite flow lobe in the foreground, we look northeasterly in this photo. That's probably Double Head Mountain just left of center; the north edge of Timber Mountain is on the far right. Coyner, Alan (ed. ), 2015, Geological Society of Nevada 2015 fall field trip guidebook: Geology of the Far Northwestern Great Basin: Quartz Mountain gold deposit, Oregon, and Lava Beds National Monument and Glass Mountain Pumice Deposit, California [for sale here, but not yet listed]: Geological Society of Nevada, Special Publication No. 60, 71 p.
Donnelly-Nolan, J. M., 2010, Geologic map of Medicine Lake Volcano, Northern California: U.S. Geological Survey Scientific Investigations Map 2927, scale 1:50,000, Sheet 1 and Sheet 2, Pamphlet to accompany the map, 48p. Donnelly-Nolan, J.M., Ciancanelli, E.V., Eichelberger, J.C., Fink, J.H., Heiken, Grant, 1981, Roadlog for field trip to Medicine Lake Highland. 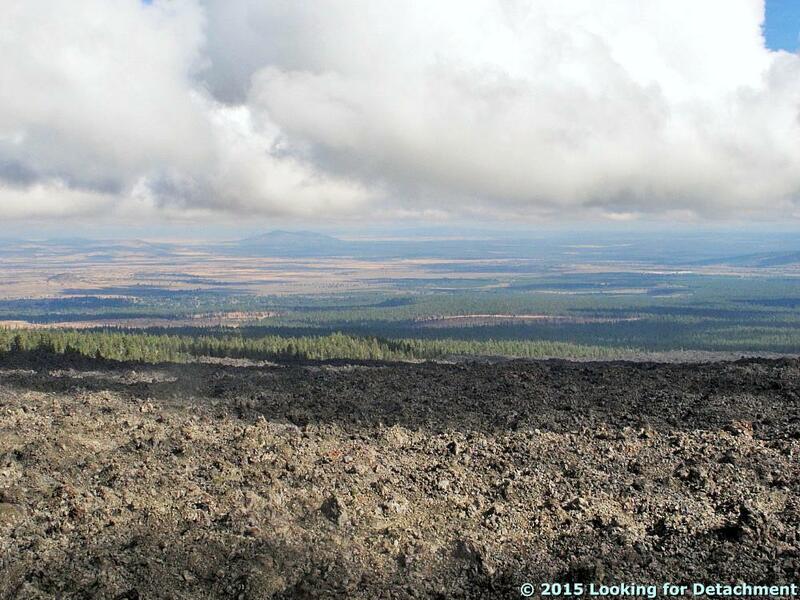 in Johnson, D., and Donnelly-Nolan, J., eds., Guides to some volcanic terranes in Washington, Idaho, Oregon, and northern California: U.S. Geological Survey Circular 838, p. 141–149. Eichelberger, J.C., 1975, Origin of andesite and dacite: Evidence of mixing at Glass Mountain in California and at other circum-Pacific volcanoes: Geological Society America Bulletin 86, v. 10, p 1381-1391. Eichelberger, J.C., 1981, Mechanism of magma mixing at Glass Mountain, Medicine Lake Highland volcano, California, in Johnson, D., and Donnelly-Nolan, J., eds., Guides to some volcanic terranes in Washington, Idaho, Oregon, and northern California: U.S. Geological Survey Circular 838, p. 183-189. Hildreth, Wes, 1981, David Alexander Johnston, 1949-1980, in Johnson, D., and Donnelly-Nolan, J., eds., Guides to some volcanic terranes in Washington, Idaho, Oregon, and northern California: U.S. Geological Survey Circular 838, p. viii-x. Johnston, D.A., and Donnelly-Nolan, J.M., 1981, Guides to Some Volcanic Terranes in Washington, Idaho, Oregon, and Northern California [pdf version; also here in html]: U.S. Geological Survey Circular 838, 189 p.
I did not realize that another name for pumice is rhyolite obsidian. Good to know! Also, 890 years ago for the Glass Mtn. flow is not that long ago. Glassy, dense obsidian should be called obsidian or volcanic glass (or can be named by its composition, e.g. rhyodacite obsidian). Pumice is one type of volcanic glass, one that is very light weight and which contains numerous vesicles from gas bubbles contained in the lava (in the case of the rocks in the photo that I was describing, a true rhyolite). 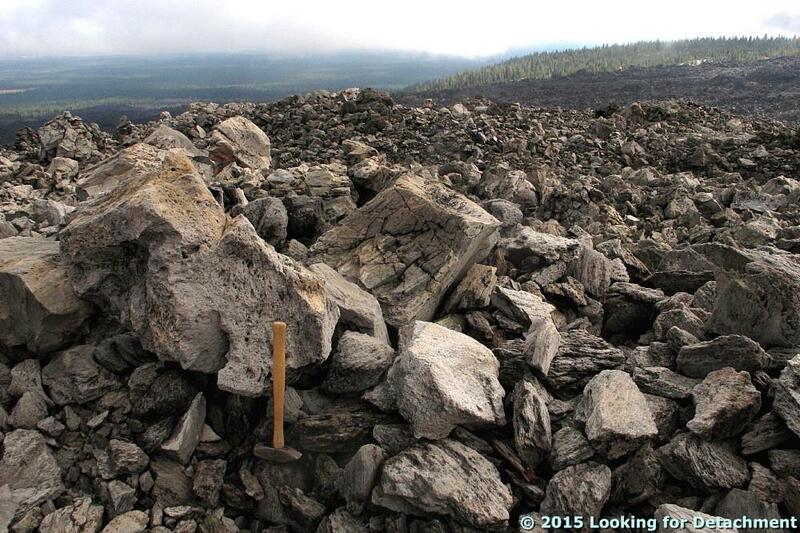 Pumice is often (maybe usually) a type of air-fall deposit. 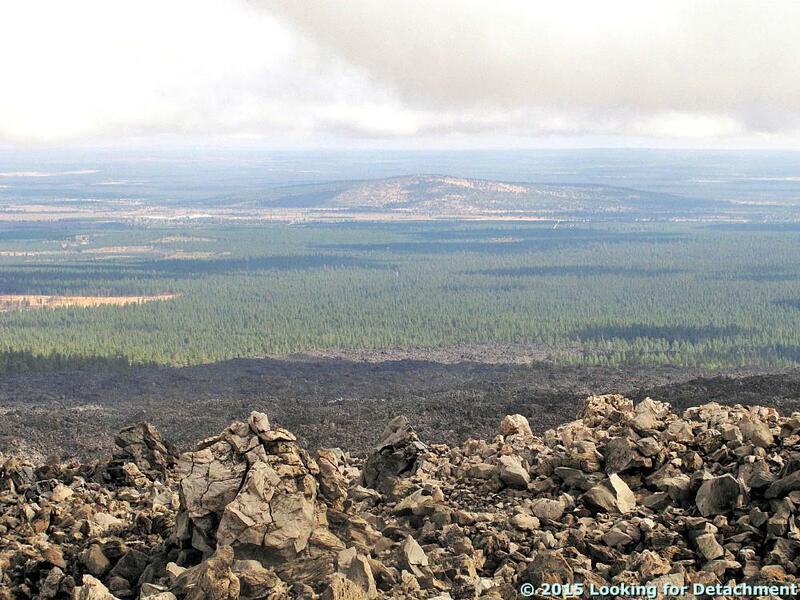 This air-fall type (a type of tephra), which I don't personally prefer to call "pumice" but am happier calling pumiceous lava or vesiculated obsidian, is part of a rhyolite flow. I don't know if the rhyodacite or dacite parts of the flow also contain a vesiculated variety. My calling it "vesiculated, rhyolite obsidian" maybe should have just said "vesiculated obsidian, in this case rhyolite (which can also be called pumice...yada yada). My first post contains three links to descriptions of this type of rock. I guess I should have included those links here. Possibly I'll revise this slightly. From the first post: "Vesiculated obsidian (pumice or "puffed obsidian", AKA pumiceous lava flow rock, part of the rhyolite flow rather than tephra)..."
So in other words, one type of rhyolitic obsidian or rhyolitic volcanic glass -- the vesiculated type -- can be called pumice. Typical black, dense, non-vesicular or weakly vesicular obsidian would not be called pumice, and not all pumice or obsidian is necessarily a true rhyolite. For example, the climactic eruption of Mt. Mazama (now Crater Lake) produced widespread pumice and ash fall of mostly rhyodacite composition (Bacon+Druitt, 1988). Besides the more scientific explanation of pumice, volcanic glass, obsidian, tuff, etc. we used a rather simple short-cut when teaching 2nd semester students who usually don't yet have enough experience with the variety of light volcanic rocks. If a highly porous volcanic rock swims on water, then it's pumice. If it sinks, it's not. You can then add rhyolitic or dacitic or whater-pumice. But it has to swim. This is not 100% right but the density of practially all pumices is around 1, usually lower. That's right, usually part of the basic definition is that it "often" floats on water. And descriptions often sa.y frothy, porous, very low density. I'm not used to thinking of it as part of a flow, but apparently it does often form at the top of a flow. The f.t. leader and Julie Donnelly-Nolan both referred to the rock at this spot as pumice, and it has been mined as pumice, I think. I'm not sure I collected a good specimen to test it on water -- I might have one frothy sample -- I should try it! Update from the Lake: First Snow!